for BWSD Staff, Faculty and Students. Hard Working. With its 2.4 GHz Intel® Celeron® dual-core processor, the 100e Chromebook seamlessly runs the Chrome OS™ operating system and apps from the Chrome Web Store and the Google Play™ Store. Tested Classroom-Tough. Built tough with rubber bumpers, reinforced ports, and a 180-degree hinge that won’t snap under pressure, the 100e Chromebook is compliant with MIL-STD-810G testing. It’s also drop-resistant up to 29.5 inches (75cm) – roughly the height of a school desk. Rugged Keyboard. The full-sized keyboard includes a sealed touchpad and resists spills of up to 1.39 cups (330 ml). And its mechanically anchored keys stay put and cannot be pulled off. Long Battery Life. With up to 10 hours of battery life, the 100e Chromebook lasts an entire school day and more. Keeps Students Connected. It’s equipped with two USB-C ports, for powerful and fast connectivity to peripherals. USB-C connectors are smaller and reversible, making for quick connections without first having to check a connector’s orientation. They also can charge your Chromebook or your peripherals, providing power in addition to connectivity. The 100e Chromebook also has two USB 3.0 ports, 2 x 2 AC WiFi, Bluetooth® 1, and a Micro SD card reader. Share and Sync with G Suite for Education. A suite of free productivity tools available on the 100e Chromebook, G Suite for Education allows students and teachers to create and share with Google Docs™, Sheets™, and Slides™. Communicate your way; connecting via email, chat, or videoconference; collaborate anywhere, co-editing files in real time. Get organized with Google Classroom. 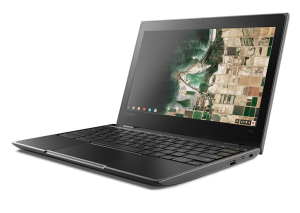 Teachers can use Google Classroom on the 100e Chromebook to save time, keep classes organized, and improve communication with students. Google Classroom is easy and fast to set up, free for schools, secure, versatile and impactful. Touch or Type. The 11.6-in HD display features 10-point multi-touch technology, allowing students to interact the way they prefer. 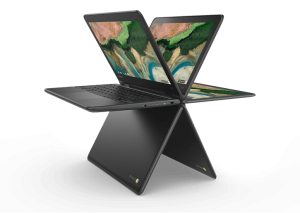 The 300e Chromebook features a 360-degree hinge, allowing students to position the display the way they need it for any usage mode – Laptop, Tablet, Tent, or Stand. With its 2.1 GHz quad-core ARM processor, the 300e Chromebook seamlessly runs the Chrome OS™ operating system and apps from the Chrome Web Store and the Google Play™ Store. Built tough with rubber bumpers, reinforced ports, and a 360-degree hinge that won’t snap under pressure, the 300e Chromebook is compliant with MIL-STD-810G testing. It’s also drop-resistant up to 29.5 inches (75cm) – roughly the height of a school desk. Long Battery Life. With up to 10 hours of battery life, the 300e Chromebook lasts an entire school day and more. Keeps Students Connected. It’s equipped with a USB-C port, for powerful and fast connectivity to peripherals. USB-C connectors are smaller and reversible, making for quick connections without first having to check a connector’s orientation. The 300e Chromebook also has a USB 3.0 port, 2 x 2 AC WiFi, Bluetooth® 4.0, an HDMI port, and an SD card reader, so it can connect to just about anything a student needs. Share and sync with G Suite for Education. A suite of free productivity tools available on the 300e Chromebook, G Suite for Education allows students and teachers to create and share with Google Docs™, Sheets™, and Slides™. Students and teachers can interact seamlessly and securely, staying synced across devices. Connect via email, chat, or videoconference; collaborate anywhere, co-editing files in real time; and manage all of your tasks, building to-do lists, scheduling tests, and creating homework reminders. Bring cohesion to your online classroom. Get organized with Google Classroom. Teachers can use Google Classroom on the 300e Chromebook to save time, keep classes organized, and improve communication with students. The app streamlines assignments, boosts collaboration, and fosters seamless communication to make teaching more productive and meaningful.